M.Ed. Special Education is a 1-year post graduation course in the domain of special education. Admission to this course is based on a students performance in his or her undergraduate course from a renowned institution followed by clearing a few relevant entrance tests. The average course fee for this course is within INR 7,000 to INR 30,000. This Post Graduate course allows a student to have a Master’s degree in the domain of Special Education. This is a fact that higher education in Special Education as a course is chosen by selected students who are interested to grab more knowledge in this field. This one- year postgraduate course has a lot of future prospectuses as one can expect a good position in the education industry. To study M.Ed. Special Education course, the student must have completed an undergraduate course with specialization in a disability. The On the completion of M.Ed. Special Education course, a student can apply for various job profiles such as a Special Education Teacher, Associate Education Developer, Business Development Executive, Senior Analyst, and much more. He or she can expect an average salary of INR 3 Lacs or even more after reaching a certain level of experience in this field. 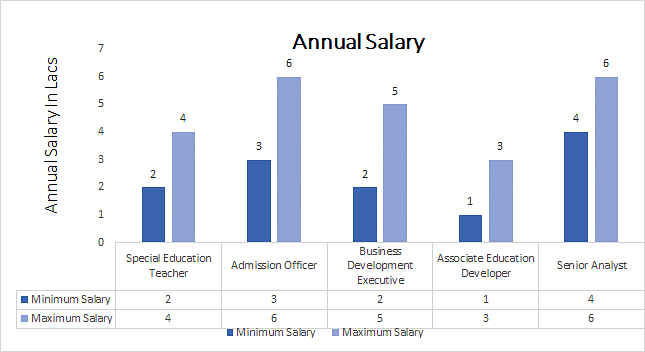 However, the possibilities of the hike in salary positive if an individual is working in abroad because, in that scenario, such job profiles are in high demand. Job Positions Special Education Teacher, Associate Education Developer, Business Development Executive, Senior Analyst, etc. M.Ed. Special Education: What is it About? M.Ed. Special Education course focuses on making the students competent in the field of special education through the detailed as well as the practical study of the same. Students are enabled to upgrade the educational standard of the nation through reaching out to all those students who deserve but don’t get any special attention. Students also gain specialization in addressing students with special needs in a way that they to cope up with their differences. The curriculum involves great instances from the real world making it an enriching experience for all studying the course. The main objective of M.Ed. Special Education course is to bring equal measures in the sector of education for the students with special need. This in a way would overall enhance the educational standards of the country and facilitate these special children to live in the real world with their differences. The course’s curriculum integrates theoretical & practical components of the study. Completed a graduate course under 10+2+3 pattern. Completed a Post Graduate plus B.Ed course in the respective disability sector. Obtained at least 50% marks in B.Ed and completed a year’s diploma course from a renowned institute. Clear the varied Entrance Exams held by institutions for studying the course. As stated earlier, in a specialized post-graduate course merit is tested in each and every step. The students aspiring for M.Ed. Special Education course must have graduated under the 10+2+3 pattern, those who have completed a postgraduate course along with a B.Ed course in a specific disability area, and finally those who have finished one complete year of diploma and obtained 50% in B.Ed can definitely pursue this course. It is recommended for students to apply through national level entrance examinations as they provide a wider exposure to the various institutes offering M.Ed. Special Education course. Along with that, there are several colleges which conduct their own entrance examinations and the students who qualify the same are allowed to pursue this course. At the end of the day, it is the choice of the candidate which allows him or her to choose between institutes and this is a fact that a large number of students every year are prepared to compete for the limited seats which are available for the M.Ed. Special Education. Below listed is the subject wise course syllabus of M.Ed. Special Education. It may vary from state to universities, however, the core subjects remain unchanged. Apart from stepping into the industry, some students might want to pursue a specialized course in M.Ed. Special Education, this can be done by pursuing an M.Phil in Special Education from a renowned university. One may even earn a doctorate in Special Education by completing a Ph.D. course.